I encountered this error when attempting to configure SCOM monitoring of a Service Manager server. For those that may not be aware, you cannot push a SCOM Agent through the SCOM console onto a system the is running System Center Service Manager. Why is that? Well, because Service Manager is built on top of SCOM. What that means, is that they use a lot of the same code base. And, if you have ever installed SCOM, you will know that you can’t install a SCOM Agent onto the SCOM Management Server, it’s self-monitoring. 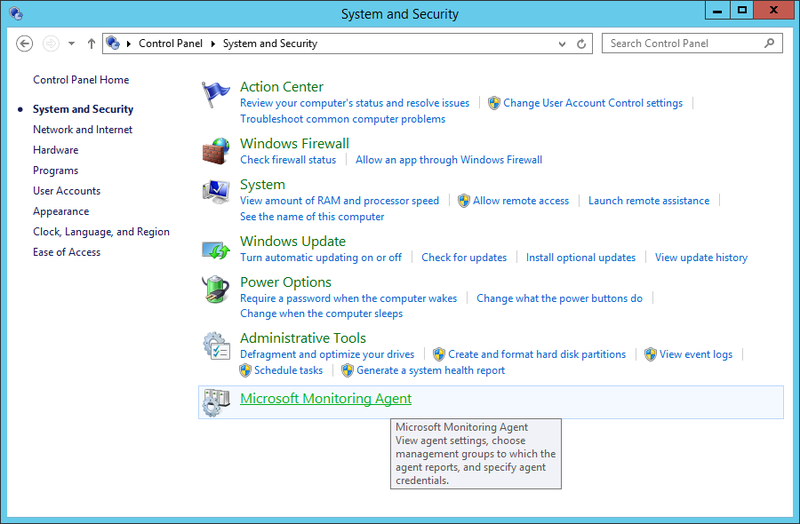 However, since Service Manager is a separate component of the System Center product (as Microsoft labels “System Center” as a single product, and each application/tool as separate “components” of that product), Microsoft has included a “Microsoft Monitoring Agent” with the installation of Service Manager. When you install Service Manager, the Microsoft Monitoring Agent is automatically installed with it. If you navigate to Control Panel > System and Security, you will see an entry for the Microsoft Monitoring Agent. 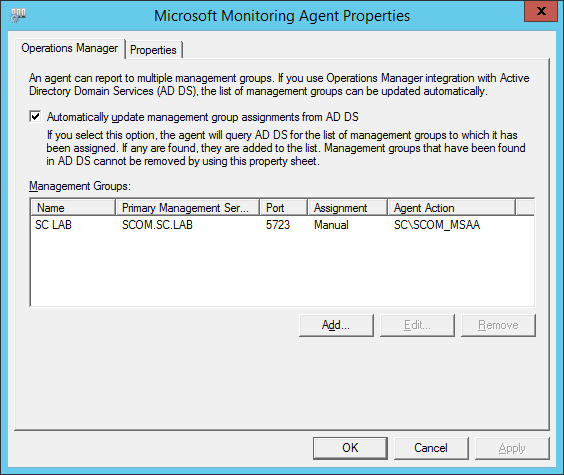 When you click on the item, it will open the Microsoft Monitoring Agent Properties dialog. I also received a notice show: “IDS_DLG_STOPPINGMANAGEMENTSERVICE, IDS_DLG_STARTINGMANAGEMENTSERVICE”. The issue is because the Management Group details is already added, even though they don’t appear in the Microsoft Monitoring Agent Properties. You will notice that that there will be an entry for the Management Group, even though it doesn’t show up in the Control Panel Applet. So, you will need to delete this entry, and then restart the Health Service. 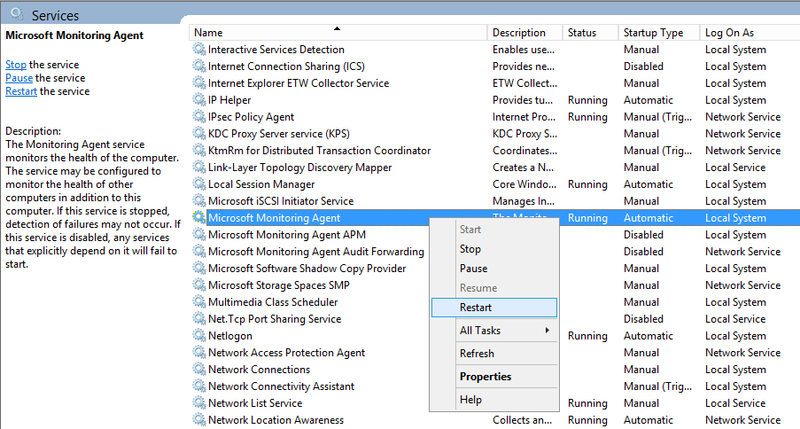 Open Services, find the Microsoft Monitoring Agent, right-click and choose Restart. 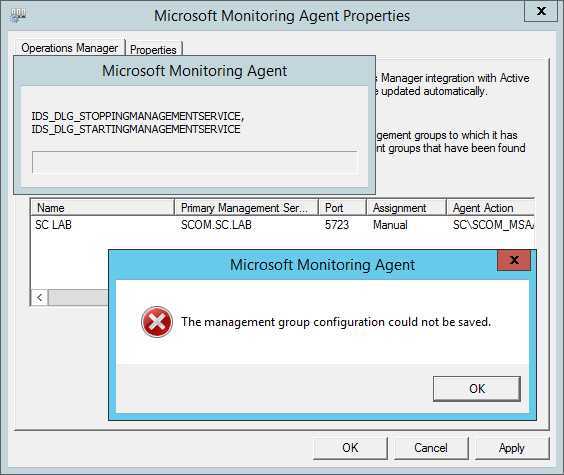 NOTE: In System Center 2012 R2 Operations Manager, the SCOM Agent is renamed as “Microsoft Monitoring Agent”. 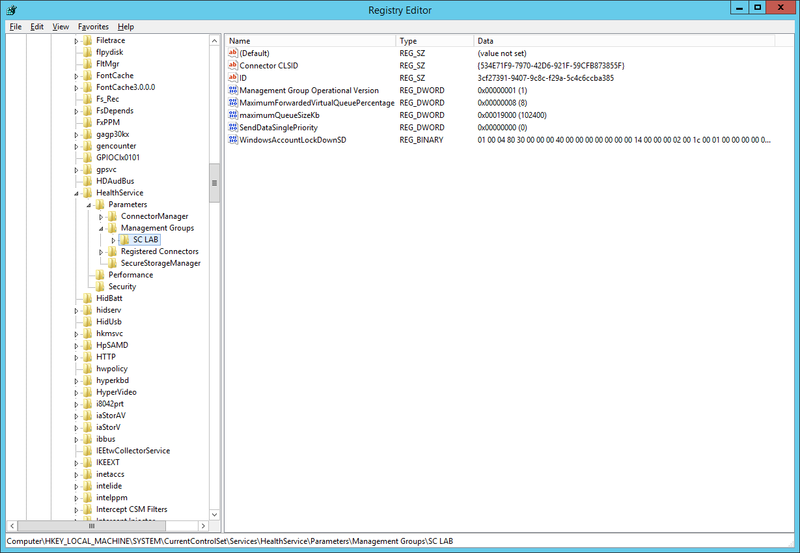 In System Center 2012 and SP1, it is still labelled as “System Center Management Service”. After you restart the service, you should be able to successfully add the Management Group in the Control Panel Applet, and be able to successfully monitor Service Manager systems with Operations Manager. 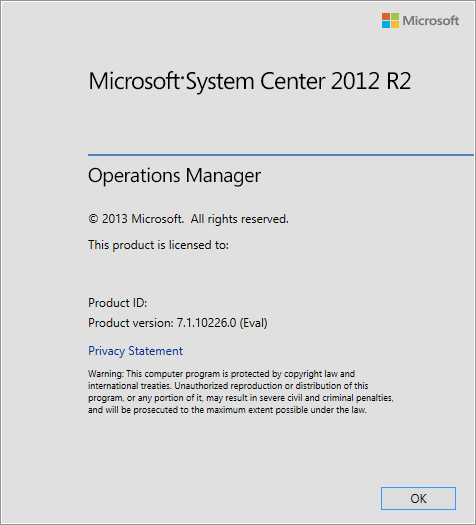 Recently I had time to install System Center 2012 R2. As a reference, I have upgraded my physical Hyper-V host to Windows Server 2012 R2. I have re-created my lab environment, using the Distributed Deployment model. My main reason for doing this, is to provide some more advanced articles/posts on SCOM. 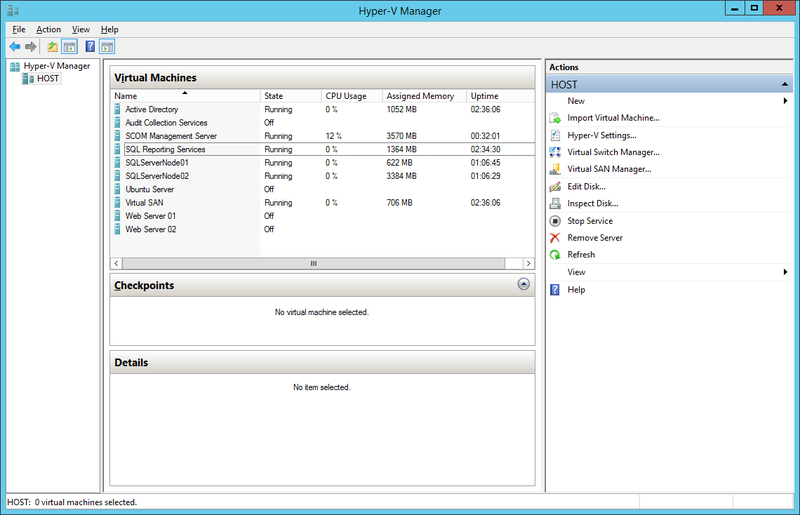 Here is a screenshot of my Hyper-V Virtual Machines. All Virtual Machines are running Windows Server 2012 R2. You will also notice that in addition to Active Directory (which is also running my Lab’s DHCP server, and Remote Access for Internet access) I have a 2 node SQL cluster, a single Management Server, a single Reporting Server, a 2 node Web Server cluster, a dedicated Audit Collection Services Management Server, etc. 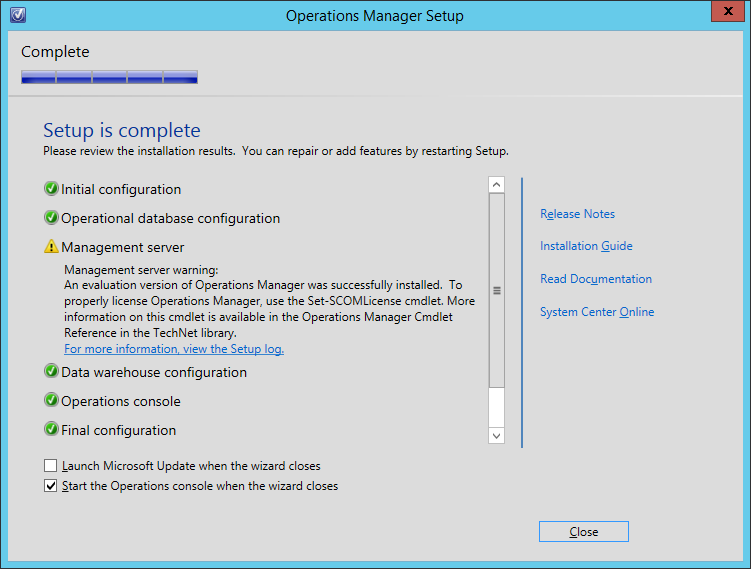 I will not detail the installation step-by-step since it is similar to the SCOM 2012 SP1 installation. However, I wanted to share this interesting change in the install process. Although in past versions of the product (though I can’t recall which one) you were prompted to choose either installing an Evaluation version or a licensed version, with SCOM 2012 R2, you are not prompted. Instead, once the installation is complete on the first Management Server, you will notice (during the actual install progress, which can be a little alarming until the install is done, in which it tells you), a Warning for the Management Server. If you launch the SCOM console and go to Help > About, you will see the “(Eval)” with the Product Version. Interesting for sure. But when you look at the details provided, you will notice that the installation defaults to an Evaluation version of the product, and to switch to a licensed version you will need to use the PowerShell command-let “Set-SCOMLicense”. So let’s take a quick look at the cmdlet. I won’t go through the actual activation, because I tend to run Evaluation-only copies of software in my Lab, since I’m always re-building. This is as far as I have gotten, and will be working on getting the Web Servers and the ACS up and running. Stay tuned.